A passenger was dragged along by a tram after a safety system failed to register that his hand was trapped in a door, a rail accident report found. 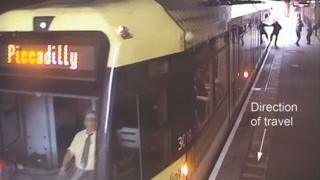 The man, who was not hurt, became caught in a Metrolink carriage door as it left Bury on 30 May. Three months earlier, drivers had been told to make a visual check before setting off after it was found that slender objects could go undetected. Tram operator KeolisAmey Metrolink (KAM) has been approached for comment. The man became stuck after thrusting his hand between the tram doors as it prepared to leave Bury tram stop at about 13:35 GMT. The Rail Accident Investigation Branch (RAIB) said he was dragged about 50ft (15m) due to his hand being too small to be noticed by the fail-safe, which does not register objects under 1in (3cm) in width. The RAIB said that, as a result, a "doors closed" light turned green which, the driver believed, indicated that it was safe to depart. The report said the driver saw the man on CCTV but believed he was part of a group "whose earlier actions had led him to conclude they did not intend to board the tram". The tram reached about 6mph (10km/h) before the driver saw the man was moving along the platform and "decided to stop". The RAIB said all UK tram operators had been warned not to rely on the "doors closed" light after an empty pushchair was trapped in a Nottingham tram's doors in December 2017. The driver of the Bury tram told investigators he was aware that the "visual check was important to monitor passenger behaviour" but was not aware of its role in avoiding setting off with an object trapped in the doors. KAM briefed drivers with that advice on 9 February, but failed to include it in an updated version of its rule book ten days later, the report said. The operator told investigators that was "an unintentional error" and said drivers had since been told to check all CCTV monitors before setting off. The operator also told inspectors that the new method was being "embedded into its driver training programme". The RAIB said the incident showed the "importance of tram drivers not relying on [the interlock system] as an assurance that nothing is trapped in the doors" and the "need for managers to provide comprehensive and consistent safety messages".